I used to live in Spokane Washington. I took a job there after struggling in Northwest Montana. My significant other and I moved there in a U-Haul truck with two small children and one on the way. We didn’t even have a car at first so I rode my bicycle to work. Soon after we could soon afford one, but I still rode my bicycle to work. I wanted to leave her with our only car, plus it was a beautiful ride and great exercise. I used to ride toward traffic so I could see what was coming at me as the particular road was fast moving with lots of incoming traffic. I had a lady literally run me off the road one day! I hit the curb, flew over the handle bars, and rolled shoulder first and head over heels. Luckily I was wearing a helmet. I was a little scuffed up but no major damage to me or my bike. On a particularly sunny May morning I was on my way to work. As I headed through a residential neighborhood, I heard two dogs in a snarling fight. I could also hear the sound of a chain-link fence rattling. As I came to the alley where the ruckus was coming from, I slowed a little to see what was going on. 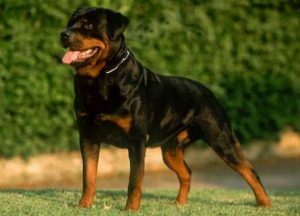 The Rottweiler that was on the alley side of the fence saw me looking at him. I guess I looked breakfast because he began sprinting toward me! He was about 2 or 3 houses into the alley so I began to pedal as fast as I could! I was heading down hill slightly and had an 18 speed mountain bike. I figured there would be no problem getting away. Not with this bad boy! He was at minimum 120 pounds and all lean. He caught up to me and was trying to nip at my leg. I can tell you that my heart was pounding and I was sweating bullets. A little quick thinking and knowing my surroundings, I swerved into oncoming traffic and down the middle yellow line. The poor guy was hit by a car. I felt horrible about it but did not have another choice. It was him or me. Looking back at the incident, I am very thankful that I have my life. It hasn’t been my only brush with death and not likely my last. My other thoughts are my concern for the safety of others as many people do not closely guard their aggressive animals. One hears about incidents frequently of attacks on children or other animals by aggressive pets. I am also concerned about ‘puppy mills’ and over-breeding of animals as this often leads to all sorts of problems with pets and livestock. I am an animal lover and a vegetarian. Just my 1 minute rant. 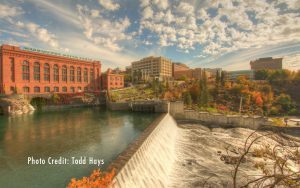 By the way, Spokane is a truly beautiful city which I will write about another time! OMG did the dog survive? The dog did survive. But with injuries. I felt horrible about it but I had to stop him somehow. HAH good story! Poor dog! I would have done the same thing. Nice post – funny. I just stumbled upon your blog via StumbleUpon and wanted to say that I’ve really enjoyed surfing around your blog posts. In any case I will be subscribing to your feed and I hope you write again soon!